I was reading this book of short stories - yet another book that's been sitting on my ereader waiting for me to glance its way - and found the story The Baron's Quarry. I kept thinking "this all sounds so familiar, have I read this before?" I'm pretty sure I have - I think it was in yet another collection of short stories. 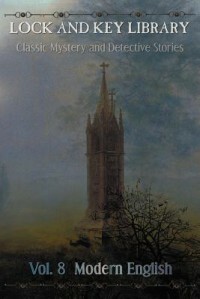 It reads very much like an Arthur Conan Doyle story, which I probably only think because I've read so much Doyle. Also might have something to do with the book placing the story right after three stories by Doyle. Here's what made me rummage around for more information - the author's name is Egerton Castle. My first thought was "That has got to be the name of a tube stop. Or a train station." Apparently I was thinking Elephant and Castle. Anyway, back to this particular Egerton. Be sure to look at the caricature on his wikipedia page - and now compare it to these photos at the National Portrait Gallery. A pretty decent caricature, that one. 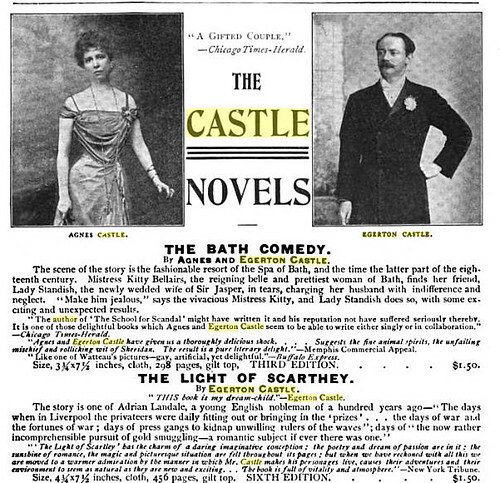 Image via google books, in The Booksbuyer, Vol 21 (Aug 1900-Jan 1901). From what I've read of the books online I gather that the Castles wrote mainly romance/adventures, often including sword fights - I'd say that was due to Egerton's interest in historical fencing. Edgerton authored Schools and Masters of Fence: From the Middle Ages to the Eighteenth Century (Internet Archive link). Image from the book If Youth But Knew (Gutenberg) that I'm going to guess is the result of a duel: "...with a certain effect of symmetry"
I skimmed a bit of that particular book and decided that the language was a bit too, er, floral for me. I have a limited tolerance for that era's "childlike" and angelic heroines. What's really annoying me is that I can't seem to find anything biographical about Agnes that's not tucked in as an addition under Egerton's name. It appears that she did publish books of her own as Agnes Sweetman (her maiden name), without Egerton in the credits - such as these here on Internet Archive - and it turns out those have Egerton's on them too, after I looked closer. It's typical of the time that she didn't exist outside of her husband's biography, but seems a bit sad that's still the case. Every era has authors that were only mildly popular for a time and then mostly forgotten afterwards. I have many, many anthologies that reprint some of the same short stories - and quite a few of those by authors only known (if at all) for those stories, despite whatever else they've written. Oh a few literature students will pick them up from time to time and include them in a paper or two, or perhaps a professor will reference them in a book. But the general reading audience won't ever hear of them - unless they wander into them online. Which is somewhat romantic in a way - it used to be that you'd only discover this kind of thing by haunting dusty bookshelves in the library, and it was always a "by chance" kind of thing. It really delights me that I can root around in old books like that - only online - and no one's going to shoo me away because the library's going to close. Anyway, more to the point - it's no more a tragedy that there are forgotten authors from days past as there are newly churned out ebooks that will be quickly forgotten a month from now. Good writing will be rediscovered, eventually. And some of the stuff that gathers dust, well, a lot of the older stuff can be eyerollingly ridiculous. ...And I think that I read The Baron's Quarry soon after I'd read The Most Dangerous Game by Richard Connell - probably in some sort of anthology focusing on "men sitting around in clubs swapping adventure stories while smoking." Connell's another author not well known today, although if you check his wikipedia page you'll see he wrote many novels, as well as the story that became Meet John Doe. But it was Dangerous Game that was reprinted over and over, and made into multiple films. Even if you haven't seen them or read the story, you might recognize the set up. Wikipedia cites it as inspiring Hunger Games, but that's the first reference I've read of that. Let me know if you remember any mention of Dangerous Game/Hunger Games comparisons, if you've read of any!